Define the key terms for electrocardiography. Recognize and explain the significance of waves, rhythms, and artifacts produced by the 12-lead ECG. Name the standard 12 leads and describe what area of the heart each lead represents. Describe how to operate and maintain electrocardiogram equipment. Describe how to perform a single-channel or multichannel electrocardiograph. Describe what causes each type of artifact and how each can be eliminated. Read ECGs using a standard procedure. 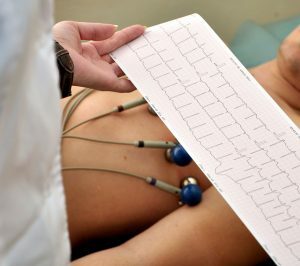 The basic EKG technician course offers the skills necessary to perform EKG tracings of the heart. This program is designed to be an introduction to the cardiovascular system and related terminology with an emphasis on performing 12-lead EKG tracings and basic rhythm identification. If you are training for a career in the healthcare industry, this skill will enhance your career opportunities in a physician’s office, clinic, skilled nursing, or hospital setting. *Additional fees may include Uniforms, equipment and National Certification Testing. Minimum course deposit of $250.00 required for all programs. Clinical externships are not included with the EKG course but are included with the Medical Assistant program.